Best-selling USB flash drive is an all-around favorite. Stylish swing design protects USB connector. Hi-speed USB 3.0 swing flash drive with silver metal cover. 2 1/4" long. PC and Mac compatible. We passed a comprehensive audit and meet Disney's standards! 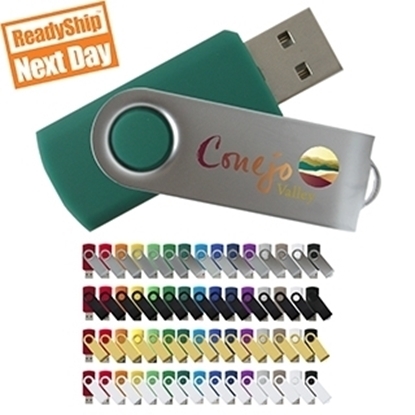 This compact flash drive will make a sizeable impression on potential customers! USB 3.0, 32 GB, 64 GB available. 10 Clip Colors: Pearl Silver, Green, Blue, Purple, Aluminum Silver, Silver, Amber Yellow, Orange, Red, Black.